This marvelous mausoleum built in the memory of “Rabia-Ud-Daurani” AKA “Dilras Banu Begum”. She was the 1st wife of 6th Mughal Emperor of India “Aurangzeb”. Of the many historical buildings that Aurangzeb has built in his life, but this is the most famous and beautiful. During Mughal rule, this beautiful tomb was the heart of the city of Aurangzeb. It was constructed between 1651 and 1661 CE. The marble used in the tomb was brought from the mine near Jaipur. According to historians, more than 150 vehicles were used to bring the marble from Surat to Golconda. According to historian Ghulam Mustafa’s composition “Tarikh Nama”, the cost of its construction was at Rs.6,68,203.7 at that time. However, the cost of constructing the Taj Mahal came to Rs 3.20 crores at that time. This is the reason why the Bibi Ka Maqbara is also called the Taj Mahal of the poor people. This tomb was built on the bank of Kham river. The main attraction of this mausoleum is in the Samadhi built on the main entrance of the tomb, which was done by the engineer Hanspat Rai alias At-Ullah. At-Ullah was the son of Ustad Ahmad Lahori who designed the wonder, Taj Mahal. This tomb is built in Charbagh Garden. The tomb is situated in the heart of a huge lavish garden. 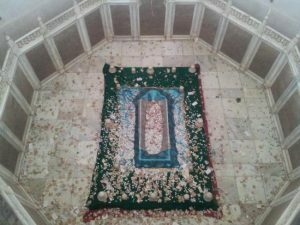 Rabia-Ud-Daurani’s dead body has been placed on the ground floor which is surrounded by an octagonal marble cover with very beautiful designs, which can be reached by stairs.Entry into this tomb is done through a wooden entrance in its south direction, on which there are excellent designs made on the brass plate from the outside. After passing through the entrance, there is a small pond and a simple cover wall which leads to the main structure. There is a series of fountains in the center of the covered road, which enhances the beauty of this pleasant environment. The Nizam of Hyderabad had built a mosque in the west of tomb. This low budget replica of great Taj Mahal is a mesmerizing monument and worth-watching. If you are in Aurangabad then you should not miss the opportunity to visit this beautiful monument. We called it as a symbol of love between Mother and Son. Many people compare this mausoleum with the Taj Mahal. 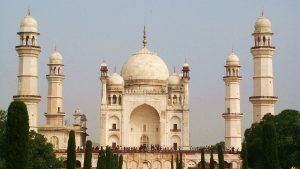 The cost of constructing the Taj Mahal came to Rs 3.20 crore while Bibi Ka Maqbara construction cost was Rs.6,68,203.7. The Taj Mahal was made of pure white marble, while the main dome of Bibi Ka Maqbara was made of marble. The rest of the tomb has been made from plaster. The main dome of this mausoleum is smaller than the main dome of the Taj Mahal. Taj Mahal is made by Mughal Emperor Shahjahan in the memory of his wife “Mumtaz”, while Bibi Ka Maqbara is built by Aurangzeb’s son Azamshah in the memory of his mother. How To Reach Bibi Ka Maqbara Aurangabad? By Air: Nearest Airport is Chikalthana, which is 12 km’s away from Aurangabad City. You can get the direct flight from Mumbai, Delhi and other metro cities of India. By Train: Nearest railway station is Aurangabad. There are many trains from Mumbai, Pune, Jalgaon & other big cities. By Road: You can get the local transport like Autos, Taxis or city buses from Aurangabad city to reach mausoleum by road. Its distance from Aurangabad is about 5.4 Kms. You can reach mausoleum by 2 roads. one is from Aurangpura which is 5.2 km’s in the distance. Other is via Dr. Ambedkar road & Mumbai-Kolkatta highway which is 6 km’s in the distance. Visiting Timings – Mausoleum remains open between 8 am to 8 pm on all week-days. Festival days may affect the timings. It takes 2-3 hours to explore all the attractions in this premises. Keep your cap, goggles and water bottle with you. Try to avoid visiting in the afternoon during summers. Entry Fees – Entry Fees for Indian’s is Rs.10 per person. While foreigners have to pay Rs. 250 per person. Best time to visit this mausoleum is from October to March. During this period you will get the pleasant weather conditions in Aurangabad. This wonderful place is one of the most visited tourist places in Aurangabad. This tomb was picturized Recently in a Bollywood film M.S.Dhoni.